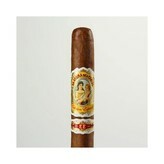 The La Aroma de Cuba Edicion Especial Minuto is a satisfying, well-made cigar built carefully and crafted by hand in Nicaragua by cigar artisan Jose 'Don Pepin' Garcia. On the outside, a leathery Ecuadoran Sumatra wrapper glistens with oils. This flavorful wrapper leaf conceals a hearty blend of aged Cuban-seed long-fillers from the black, volcanic soils of Nicaragua. Together, these tobaccos produce a smoking experience layered with deep, toasty flavors. Notes of cedar, leather, and white pepper permeate this medium bodied flavor bomb.